Back in 1988, John Calhoun released a simple 2D (of course) paper airplane flying game for the Macintosh known as Glider. The goal was simply to fly from room to room in a house without hitting the walls or obstacles. It was quite a bit of fun and gathered something of a cult following among Mac gamers. Clever Coding has just released what’s more or less a modern, 3D version of this classic. Paper Pilot [App Store] puts the player in accelerometer-based control of a paper airplane moving from room to room across eight different environments. Speed is controlled with a swipe to the screen. The goal is to collect dangling paperclips strewn about the rooms in the best time possible. Unlike in Glider, however, bumping into things doesn’t cause a major hazard (which is unfortunate, actually). Starting with only 2 courses unlocked, fly qualifying times to receive your Test Pilot, Fighter Pilot and Captain’s rankings, while unlocking the next levels. Your flying skills will be squarely challenged as you unlock longer courses and qualify for more and more ranks. The developer suggests that Paper Pilot, based on the Unity Engine, features unsurpassed graphics with a level of detail and richness unseen elsewhere in the App Store. Whether or not that’s in fact the case, the environments are indeed impressive with particularly well done lighting. The game runs at a decent framerate on the iPhone 3G, but isn’t glass smooth and a bit of chop crops up here and there. Surely the title shines a bit brighter on the faster 2G iPod touch. See the developer’s Paper Pilot video page for several gameplay videos, including a higher quality version of the clip embedded below. 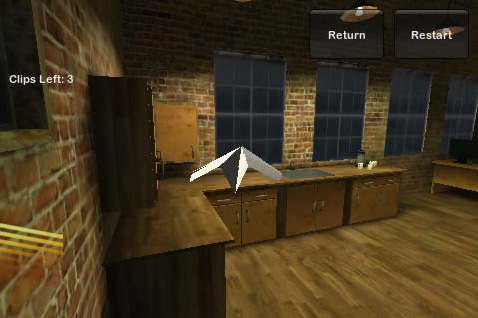 Flying a paper airplane from room to room in these realistic environments is a pretty fun diversion. Darting behind an office desk, swirling around a ceiling fan, or just trying to locate that last floating paper clip isn’t a bad way to spend a bit of the daily commute. It’s a unique, casual flyer that most iPhone gamers will probably find worth a spot on their app list. If feeling tiny and flying a paper airplane from room to (realistic) room sounds like your cup of tea, give Paper Pilot a try. It’s a unique iPhone flyer that might just make you nostalgic for Mac classic Glider.